"Tango is… an expression, starting in the head, unfolding in the hart, legs and feet drawing silent shapes which reveal the unexplainable… He asks, she answers in an intimate conversation without words, as a never-ending game always on the edge between seduction & sensuality, within the delicate space of a gentle embrace… together, exploring each other on the tunes of a bandoneon." A well known and successful Argentinean Tango couple of the knew generation with a profound base of classical & contemporary dance, formed by the greatest Argentinean tango maestro’s of all times. Their name is inextricably bound to qualities such as intimacy, communication and sensuality when connected with Argentinean Tango. Their classes are a never ending source of inspiration thanks to a very individual approach to communicate a profound technique of “follow & lead”, “axis & abrazo”, “dancing emotions” and especially the search for “making movements happen naturally instead of memorizing them”. As true surgeons they treat your tango problems directly at the base. Making even the most complex steps as simple and easy to understand as the basic “salida”. When Callan Correo left Belgium in 1991 for his studies at the “Centro de estudios de education fisica y actividades deportivas, Buenos Aires – Argentina” he could have never imagined that it would lead his life into a whole new direction. The South American blood got hold of him and changed his life forever. Thanks to this opportunity in Buenos Aires he was able to meet and socialize with numerous people who were, as history proves, destined to become big stars in the world of Tango of today. Over the years during numerous holidays (both to Argentina and friends visiting him in Belgium) they took it as their personal challenge to introduce him into the world of tango. Not only the dance but especially the whole culture and Argentinean inheritance which lies hidden underneath the Tango. Together with Chantal Lathuy, in whom he found someone with the same vision and passion, they were tutored by some of the greatest Maestros of today in the world of Argentinean Tango. Naming all of them would take us to far but amongst those who made a lasting impression on him we find names such as Juan Carlos and Johana Copes, Fernanda Ghi & Guillermo Merlo, Manuel Ortiz, Mariana Montes & Sebastian Arce, Adrian Veredice & Alejandra Hobert, Pedro Andrade, Roberto Reis & Guillermina Quiroga. During their journey in the world of Tango they never took the easy way. Always going for what they believed to be the right way to express and share their passion with students and people from all over the world. In 2006 they made a personal goal of introducing Tango to young children. For which they received the Nadia Kuypersprijs for Youthwork in March 2007. Thanks to this unshakable belief in what they were doing they were offered opportunities in press, TV and film which became part of their daily world. Thanking everyone they met would lead us too far but when they were offered to perform and cooperate in the making of the Belgian short film of Guido Thys “Tanghi Argentini”, they did not hesitate at all. (production: Another Dimension of an Idea/Anja Daelemans & Dries Phlypo) Tanghi Argentini which was released in 2006 proved to become the most awarded Belgian film ever. "Cuando te quiebras en una sentada, juntando tu carita con la mía yo siento que en la hoguera de algún tango, se va a quemar mi sangre el mejor día..."
"When you brake into a sentada, joining your face with mine I sense that in the passionate fire of some tango, my blood will burn the best day ever..."
… is the cultural organisation of Callan & Chantal, with the objective of promoting overall multicultural activities and especially promoting & developing Argentinean Tango culture by animations & exhibitions, formation of dancers and teachers, workshops & classes, choreographical contributions, events and the creation of international theatre productions such as “Toxic Tango”, “Toxic Tangueras”, “Tango Voltaire”, “Tango Fricassée”. One of the most important projects of El Rumbo is the establishment of Toxic Tango Productions in which the educational training program, following the Argentinean example takes a central role. With this project Callan & Chantal are creating opportunities for motivated artists who seek their way in the international world of Tango Argentino. The aim of this educational training program is not only to provide a dance-education, but an overall formation-package of dance (Tango, Milonga, Tangovals), contemporary & traditional techniques, methodics, history, styles, music, culture & ideology, intentions & emotions through body-language, etiquette, improvisation & choreography, dancing & acting for TV, movies & theatres. The artists in this program could be admired thanks too their cooperation to several events and productions. They are cooperating on a very regular base with the Belgian media such as Television, Radio and national press. (één, VUM, VTM, Q-music, Donna, radio 1, radio 2, Studio Brussel, Woestijnvis, ATV, Ring TV, ROB, all National Newspapers, Magazines, etc). Amongst others they cooperated in Belgian TV programs and soaps such as “Familie”, “thuis”, “Dans Mondial”, etc. and their events were several times reviewed on the National News. (TV and written press). Companies such as VRT, VTM, ING, SAS, Belgacom, Connectis, Vandemoortele, Damart, Debic, Rabobank, Dexia, DVV en Mexx turned to El Rumbo for introductions, coaching, seminars, lectures, exhibitions and animations. 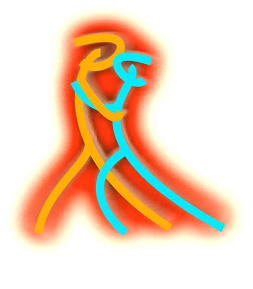 Their Tango shows with Belgian dancers and musicians are considered of important value by Argentinean (Tango) authorities. Several teachers, both national as international found their way through this organisation. Toxic Tango Productions is amongst the very few international dance companies (most of them Argentinean) who are specializing in this kind of Tango shows for theatres. Their productions were performed in the most important Belgian theatres such as BOZAR (Centre of Fine Arts Brussels), NTG (Ghent), Stadsschouwburg Leuven, Capitole, NTG, Flemish Opera (Ghent), etc. And over the years they performed in several smaller cultural houses where they could count on a very loyal and appreciating audience. Amongst their most recent achievements, the whole team cooperated together with Callan & Chantal to the making of the Belgian short film “Tanghi Argentini” of Guido Thys. Tanghi Argentini was awarded from its very first day on at the première at the international film festival of Ghent (Belgium) as Best Belgian Short of 2006 and became quickly the most nominated Belgian film ever! El Rumbo took care of the dance production, choreography, coaching of actors, walk-ons, dancers, etc. Both Callan & Chantal and their dancers appear in this short film. Since then Tanghi Argentini was invited to more then 68 international film festivals all over the world and won more then 29 prestigious Awards at festivals such as: Clermont-Ferrand, Aspen, L.A (BAFTA-award), Moondance (Hollywood), Abu Dhabi, Nashville, Rhode Island, New York, Bermuda, Granada, Almeria, Corto, Seattle, Milwaukee, Sweden, Sao Paulo, Berlin, Montreal, Melbourne, Argentina, Cannes, etc. On January 22th 2008 it even received a nomination for the Academy Awards/OSCARS 2008 for the category "Best Live Action Short Movie". A theatre production based on the short film. Based on this short film, El Rumbo created a brand new theatre production. “Tango Fricassée”, a sensual mix of the film itself, live music, sparkling dance-acts and stories & poems which make you dream of the Golden Age of Tango when courtesy, elegance & seduction were still words with a deep soul & meaning. Tango Fricassée will be available for bookings as from April 2008 on. ...after seeing the Theatre production “Toxic Tangueras” created for the international day of solidarity for woman at the BOZAR (CENTRE FOR FINE ARTS, BRUSSELS). FELICITACIONES Y MUCHOS EXITOS MAS!! !